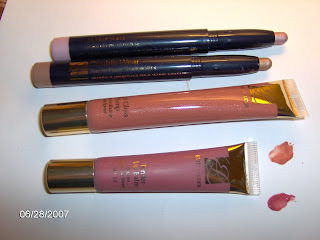 Well Estee Lauder has lots of goodies in store for the fall season. I have gotten to try many and I think you will like all of them. I can report now on the lip products. The eye ones will have a better review soon. The company is also repackaging and reformulating Idealist Skin Refinisher. It is now 3 times as strong as it was. Reviews of the eyeshdow and liner to come. 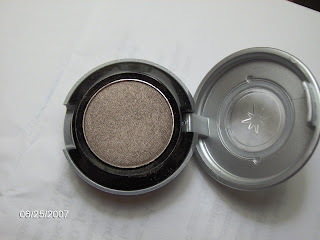 I had to try this new shadow from Urban Decay, first there is the name Stray Dog. I also have Stray Dog lipstick ( although not a great shade for me) and the nail polish, which came years ago in a Todd Oldham dog dish with 2 others called Alley Cat and Shelter. This shadow is the perfect taupe, more brown than beige-grey. It has such a smooth, velvet feel, goes on nicely and has medium shimmer. Hot Dog is more like it. A great all around , all the time shadow. Urban Decay eyeshadows retail for 16.00 at Sephora, Ulta, and many department stores. By the way, on the website, they are offering an eyeshadow kit box for 15.00 when you buy six shadows. It's very nice if you have a large collection of Urban Decay. Got my hands on some C Shock and I have to say it is way more wearable than you would think. The colors mostly are sheer. 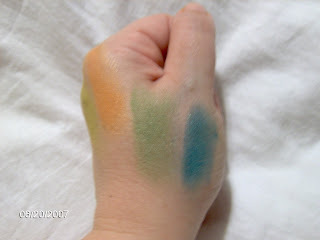 I took pictures of some of the shadows and lipsticks on my hands to give you an idea. From right I have on Eyepopping- acid green yellow which you can barely see here, I wore this today and it goes on really well, almost semi matte and looks nice, Fab & Flashy- orangy bronze, Wondergrass, a beautiful green that is the love child of Swimming and Juxt, and Big T, a deep teal that does not go on sheer but on one with dark hair and eyes would look great. The lips are Overrich lipstick- I LOVE this, sort of close to a Paul and Joe favorite from last year, Sugar Shock Lipgelee- very sheer berry, She-Boom Lipgelee, a fushia like deeper tint. 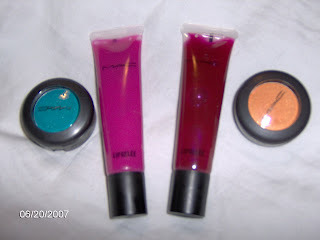 These colors are sort of an 80s look according to MAC, but I see that mainly in the lip products. The eyes were not so strong in color then( although bright yellow was one used), but the lips , yes. Hot Pink was big. 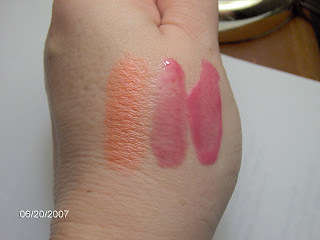 C Shock also has a nice medium berry pink lipstick, and a pale blue lipstick. It really is blue on too. That is 80s for sure. You had to rock the New Wave or Punk scene but it was there. I am pleasantly suprised by this collection and they are so fun to look at. There may be something for you even if you don't think it. C Shock is on the counters until July 18th. Rap Star Eve is wearing colors from the new MAC Collection C Shock in her latest video Tambourine. Her makeup artist JJ( former MAC artist) asked to use these colors. I love the lips in this picture. The eyes rock, but it is certainly not a " street " look. Feel free to join in and talk MAC. I was given the opportunity to try out several NIOXIN Hair Products awhile ago. Some of the products weren't what I needed, so to give them a fair shake, I shared them with two guest testers with hair difficulties. One is a double processed blonde who needs volume, and moisture for her fine hair, but not greasiness. The other is a man who spends all day in the sun, has thin hair and has an itchy scalp a lot. We were all impressed and happy with what we tried. I tried the shampoo from NIOXIN treatment set 7 .This set is for medium coarse, normal to thin, chemically enhanced hair. It contains GlycoColor Shield which is said to help the hair retain color. Now I was worried that this would be too much moisture for my hair, as I have oilier hair, but do have highlights also. I waited to use until after highlights were added again. This shampoo cleans really well, but does not overly mositurize. It's just right. I used light conditioning and my hair stayed great. I like the idea that it will help keep the highlighting from fading as fast. I have used it for 2 shampoos so far. Obviously , I need to wait a little longer for full results, but overall I like this, and will buy it again. Our Double Processed Blonde tested the Deep Repair Hair Masque. Her word to me was " fantastic". She said" that hair repair is fantastic". Now these are serious words of praise from a lady who has a closet full of reject hair products both high and low end. She has been using Aveda Deep Conditioner for some time, and she is thinking of staying with the Nioxin now. She said it not only really softened the hair (almost too much if left on too long) but it even boosted volume . Her hair looked great. It is recommended to leave it on for 5 minutes for best results.It is meant for seriously damaged hair. The test of tests to her was the consistency of the product. It was very thick in the tube, a sign of a good one. Our guy tried the scalp therapy from my treatment system set . The scalp therapy is put on in the shower after shampooing, left on for a couple minutes and the rinsed out. It conditions the hair and scalp, moisturizing both. He thought it worked very well. A man of few words. However, I noticed right off that his hair seemed softer, and fuller. Much less dry than before. He also said it did seem to calm the itching scalp. The Deep Repair Masque is 13.99 for 5.1 ounce and comes in a larger size. 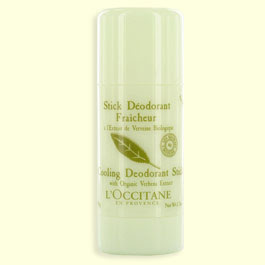 Per Elle, there are 2 new, interesting products from L'Occitane to help our overheated selves . 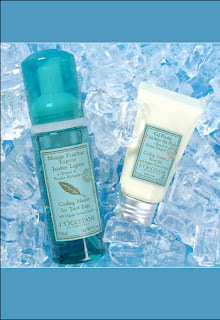 Cooling Mousse for legs, and powder-gel for feet. Now I remember the Body Shop leg cooling gel and spray. The spray was ok, the gel ok. I think these look worth trying and hopefully are better than the Body Shop. "This alcohol-free stick deodorant:- glides on very easily and dries fast- prevents bacteria development, that causes body odor- has the long-lasting scent of the fresh and sparkling citrus. Formula free from alcohol, paraben and aluminum salt." This is a must try. Sells for 15.00. No prices on the other products yet, and they have not been listed on the website yet,either. I am back , at last. Thanks for hanging in. FOR THE BOLD, THE BAD, THE WILDLY DARING. TWO TO CLASH…OR SELECT JUST ONE! SEE HOW IT ELECTRIFIES YOUR LOOK. LIPSTICKS, LIPGELEES, AND EYE SHADOWS. IF COLOUR IS YOUR THING, DON’T BE SHY. I am having internet connecting troubles as of last night. It's on now, and hopefully will stay, but it goes off at times. If I don't post for a day or so, thats why. Will be on the phone with service again tonight. 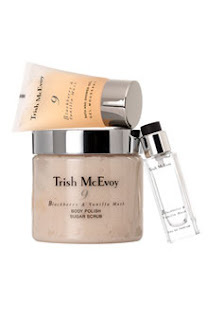 Nordstrom has an exclusive to them set of Trish McAvoy #9 fragrance. This is a wonderful blackberry musk fragrance that is great for the hot months. I am thinking the body scrub is new. #9 Blackberry & Vanilla Musk Body Polish Sugar Scrub: Treat your skin to a skin-softening treatment. Rich, creamy and infused with sugar granules and sea salt, Body Polish Sugar Scrub gently exfoliates your skin, leaving it velvety smooth to the touch. Richly scented with the warm aromatic scent of Blackberry & Vanilla Musk. #9 Blackberry & Vanilla Musk Eau de Parfum (0.5 oz. ): A youthful and inviting blend of sweet blackberries and vanilla mixed with the warm aromas of musk and white rose. also coming to the store exclusivley is a set of Vera Wang Princess Perfume " pearls", they are little capsules that contain just enough fragrance for an application. Apparently they come in a jeweled container. This was in Marie Claire July Issue, but I cannot find a pic online. This Sunday's Tony Awards brought out the celebs like many award shows, but the look was more edgier, dark smoky eyes, dramatic dresses. Less glam than LA but better in a way and still glamourous. and Claire Danes sharing the smoky eyes of the previous ladies glowed with an unusual choice of gown that was beautiful. 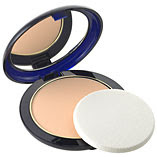 After much ado it seems, I am using and loving this powder foundation from Estee Lauder. It took several tries to get the right shade, a light enough one, For some reason the first time the SA tested it on me, he went for a deeper shade than I am. I think I was trying yet another makeup that was too dark, so maybe that was it. With the wrong shade it looked truly bad. Too cakey, powdery, and well, bad. I really didn't think it was for me at all. I persevered( because I like powder foundations and was determined to give this a test). I am glad I did. With the right shade it looks great, not cakey at all. It blends well, and at first seems a bit powdery , but quickly blends into the skin for a nice medium finish. The foundation is long wearing according to the packaging, and it really is. I have been using it a lot in the past few weeks, and reach for it most days now. Today was blast furnace hot and humid and this combined with some Bourjois Matte Lovely foundation ( another lasting, matte winner), it stayed shine free almost for the whole day. I used it as a touch up once over the other foundation, and I was ready. When I use it by itself it holds up equally well, even on the t- zone. The one thing I find is that it doesn't cover spots as well. You need extra help there, and I often don't use concealer. It keeps the oil down( without primer under), and looks good long. Garnier's cleanser line came out here in January. I had looked at them a lot but never tried any. I finally tried the Nutri Pure Detoxifying Cream Cleanser this week. I love it. I am often searching for a great cleanser, and not finding them . I try a lot, and then try more. The Garnier cream cleanser really gets the makeup off. It is very thick and you only need a little. It is very soft and it smells great. Really great, like Elizabeth Arden's Green Tea Fragrance. The cleanser does have Green leaf extract, as well as Vitamins E, B5, and Grape Extract. All to help the skin. Skin feels very soft after cleansing and in this weather, I need no moisturizer after. In winter, this would be even better. I have my eye on the gel version of this, and may try that, but I will return to this cleanser. I am as impressed with a cleanser as I have been in a while. The last was DDF Glycolic cleanser, which I loved, but I really didn't like the 25.00 price tag. I prefer to spend less on cleanser if I can. At the CFDA Awards Debra Messing was sporting very dark nails, either black or super dark purple to go with her pretty purple dress. 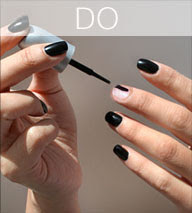 Eevn though we have been hearing about more brights for summer, apparently the dark nail look goes on. Something different for summer. I think it looks good on Ms. Messing. Michael Kors dressed all the ladies doing their " Angel " imitation here. 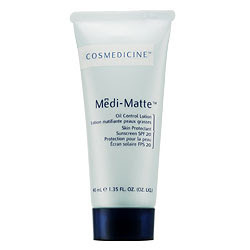 Cosmedicine Medi Matte is the first, and only mattifier I have used that really works. I love this. I hoard this. I have used many by other brands and they may have helped a little but Medi Matte actually works long term on the T zone. It is a thick cream gel that goes on easily and only needs a minute to sink in. I then apply my foundation and am ready to go. It keeps the oilies at bay quite well for hours. It also has SPF 20. A tube costs 42.00 at Sephora, so it's not cheap but cheaper than the 2 others I have that I don't use in the end. Sephora should be able to make you a sample, so try it if you can. This is the first in My Summer Must Haves Posts. Hopefully I will get to share more of my finds with you soon in between new info. I have been wanting to try this for awhile, and finally have. I used it today, thinking I could probably not do a review until I see how it fares in the lasting on the eyes category. Well I was just out for awhile in the 90% humidity we have been having, with 90 degree temps, and it didn't budge a bit, so review is on. This mascara is relatively new from Maybelline, debuted in March. It has a very flexible wand, and goes on very easily but needs several coats to get going. After 3 coats I had very long lashes. It does define the lashes individually, and lengthens. It does not add any volume, but the packaging does not claim that anyway. It is meant as a lengthener. Each lash was spiky and long, and stayed that way. I used Very Black but didn't think it super dark, just a bit darker,maybe. Overall I like this so far. I tend to like the volume as well, but will definitely use this. I especially like that it is smudge free. Update next day : In the rainstorm today, this did smudge just a bit. It's very hard to have a mascara that doesn't smudge on me. I have a few that I love, but I like to try new ones sometimes. That said, this is still nice and if you don't have smudge difficulties, give it a try. I will use it again, just not in the rain.